On December 18, 1915, Edith Bolling Galt married President Woodrow Wilson in a ceremony at her home in Washington, D.C. This very private event was celebrated in a very public way by the Sussex Print Works, of Newton, New Jersey. The firm created four printed dress silks, in black and white, titled "Bolling Crest," based on the design of swallows and ants (yes, ants) featured on the coat of arms of the Bolling family in England. 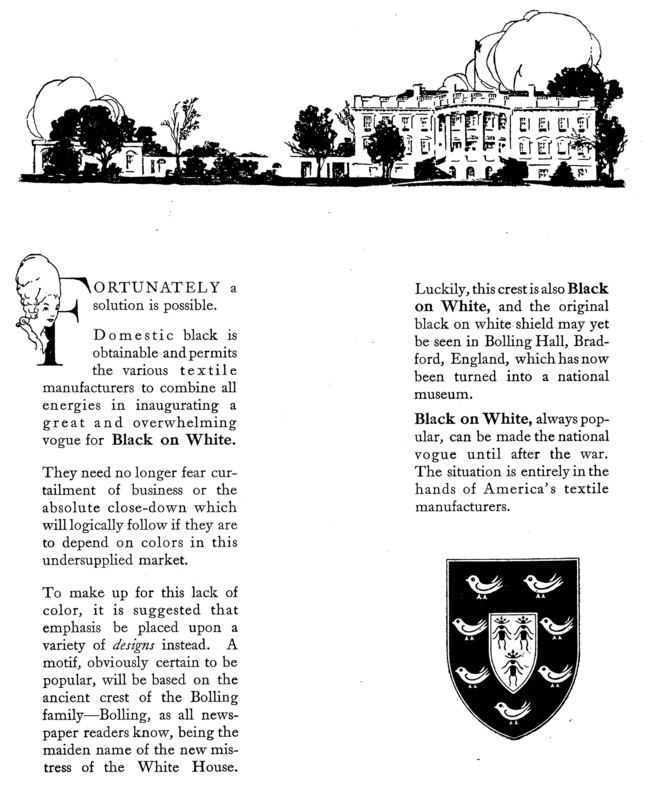 The manufacturer noted in its publicity that "the original black on white shield may yet be seen in Bolling Hall, Bradford, England, which has now been turned into a national museum." The color black may seem like an odd addition to fabric celebrating a wedding, but there was a reason for the color choice. 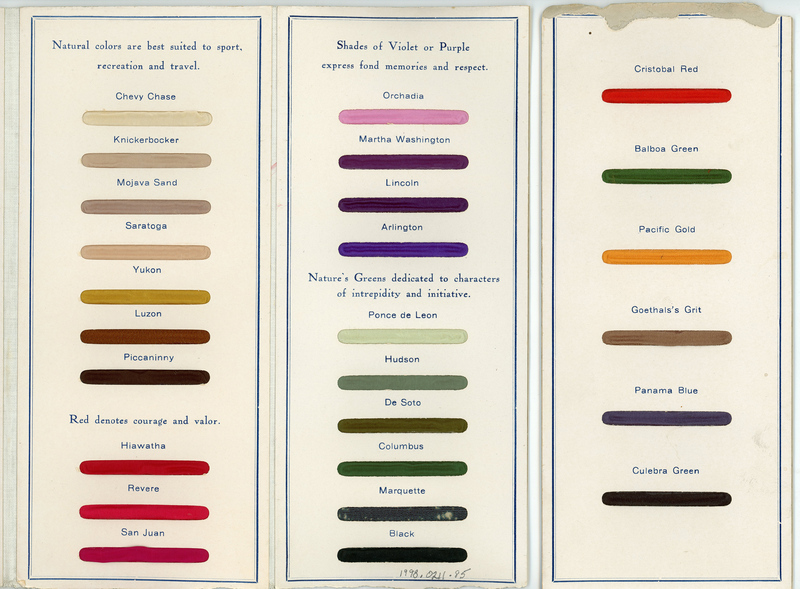 German firms were the most important manufacturers of synthetic textile dyes and colorants in the early 20th century. In March 1915, several months after the beginning of World War I, the British navy began to blockade German ports, preventing any exports of goods overseas. As a result, the textile and paper industries in the still-neutral United States suffered a serious shortage of good quality synthetic (chemically based) dyes. "Sulfur black" was the one dye that firms outside Germany produced in quantity and of consistent quality. 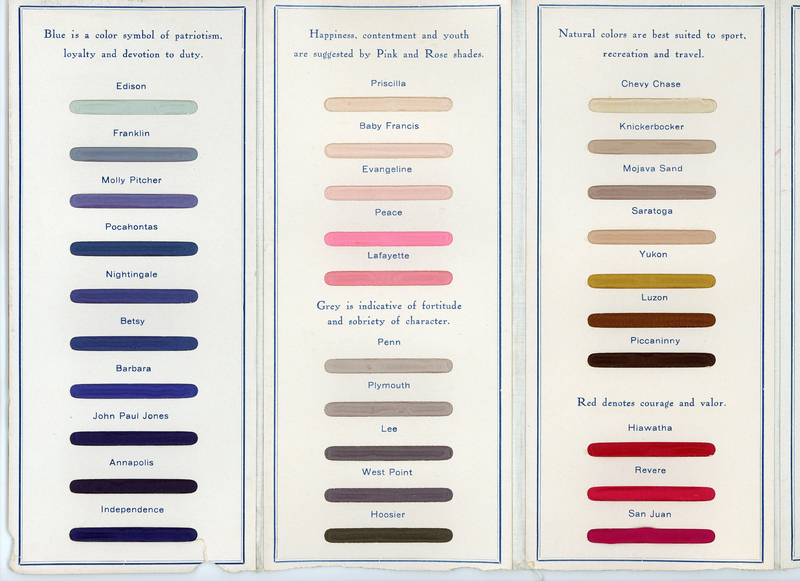 Some firms reverted to old technology, and tried to adapt old formulas for natural dyes to modern industrial needs, but the quantities were small and the color range limited, and not always fast to light or washing. Fashion magazines from the period illustrate the efforts by many leading American textile and fashion manufacturers to create a fad for black and white clothing and accessories. French and English fashion firms, suffering under the same dye shortage, were also promoting black and white. In those countries, however, already at war, black and white clothing carried overtones of loss and mourning that were not yet relevant to most Americans. When the U.S. entered the war on the Allied side in April 1917, anti-German feeling was rampant. Many companies owned or managed by men with German-sounding names abruptly changed their names or merged with other firms under new names. Among these was National Aniline & Chemical Co., of Buffalo, New York, which was formed in 1917 from the merger of Schoellkopf Aniline and Chemical of Buffalo, Beckers Aniline and Chemical of Brooklyn, and the Benzol Products Company. 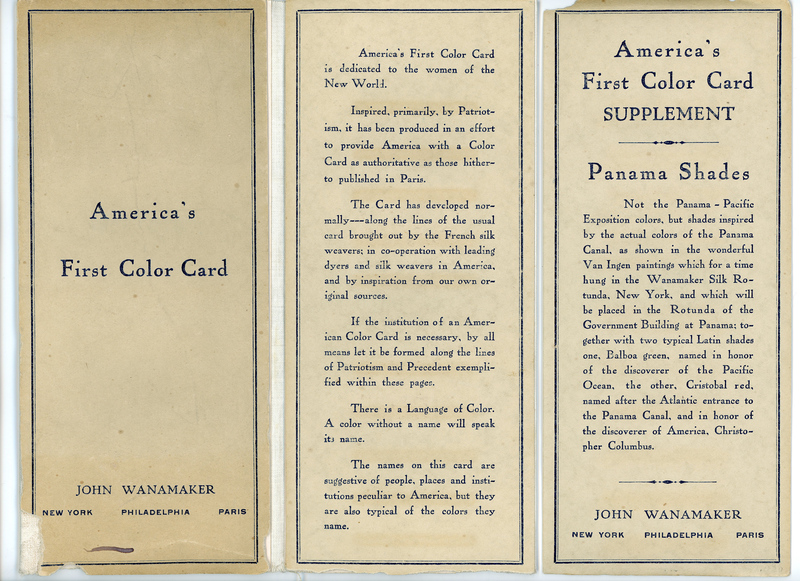 National Aniline, and other American dye companies—all of which produced pharmaceuticals and other chemicals as well as dyestuffs—received a gift from the U.S. government in November 1917, when Congress passed the Trading with the Enemy Act. This allowed American companies producing goods that contributed to the war effort to confiscate enemy-owned patents and use the technology in their own manufacturing. Through what has been called "compulsory licensing," the dye shortage ceased. The Sussex Print Works began operating as a department of the Thomas W. Bentley Silk Company in 1885. Thomas Bentley was born in England, but his family moved to the United States when he was 11. He learned the silk business as an employee of Doherty & Wadsworth, a silk manufacturing company that had opened in Paterson, New Jersey,—America's "Silk City"—in 1879, before opening his own silk mill in 1885. The company name changed twice, to the Sterling Silk Mill and then Valentine & Bentley, before the Sussex Print Works was spun off in 1911 as an entity on its own, under the leadership of Bentley, his son Herbert Bentley, and Harry T. Rounds. It specialized in dyeing, printing, and finishing all silk, silk and cotton, and silk and wool textiles, and was highly regarded within the industry for quality production. Valentine & Bentley became Bentley & Twohey in 1915, and continued in business as a manufacturer of silk fabrics until 1932. Madelyn Shaw is a curator in the Division of Home and Community Life. She recommends checking out the Bolling Crest Silks online object group for more information.